The people engaged in firefighting needs protective clothing which can save their body and life from the effect of heat and flame. It is sometimes found that the firefighters become injured or even dyed during fitting against fire. For that causes, it is mandatory for them to wear protective clothing or apparel to fight against fire. What Type of Fabric Do Firefighters Wear? Firefighter suit should be made from three-ply fabric. The outer ply fabric should be flame retardant, middle ply fabric should be the vapor barrier and the inner ply fabric should be the thermal barrier. Outer layer fabric may be made from aramid fiber, blends of novoloid and aramid fiber or fire-resistant cotton. 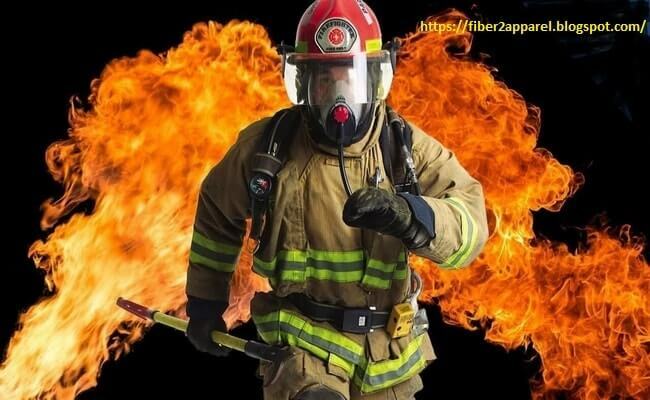 As an outer layer fabric, all the mentioned three types of fabric become embrittled within 10 seconds in contact to flame but the blended fabric of aramid and novoloid fibers are less brittle in such condition. Firefighter suit made of above mentioned three types of outer ply fabric if used during firefighting; the wearer may be injured when in contact to flame for 28 to 50 seconds. The inner layer fabric is made of aramid fiber is not damaged in such situation. The middle layer fabric protects the user from the vapor and harmful chemicals fume when engaged in fitting against fire. But later may be sick due to the action of self-sweating and vapor. For that cause, the European firefighter's suit is made without the middle layer (vapor barrier) fabric. What Materials are Used in a Fireman's Uniform? As suitable clothing for firefighter, three-ply woolen fabrics may be used. The outer ply fabric may be made of wool serge which is fine but densely woven fabric. The middle layer fabric is coarse and brushed woolen, works as heat resistant. The inner layer fabric works as lining made of lightweight cotton fabric. As a firefighter clothing, the effectiveness of the clothing is related to the thickness of the clothing. Higher the thickness of the clothing betters the effectiveness of the clothing as firefighter suit. It should be kept in mind that excessive thickness of the clothing will be discomfort-able for the user due to the heavy weight of the suit. Firefighter suit has been tested made from 56 types of fibers for their performance of fighting against fire. The fabrics were made from cotton, a mixture of different cellulosic fiber, aramid, wool, leather, asbestos, glass, and ceramic etc. as a firefighter suit, effectiveness of the clothing is more dependent on the thickness of clothing than the fiber type.